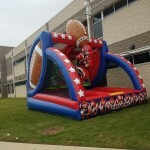 Jump City’s Football Challenge two lane Football Toss Inflatable Game! 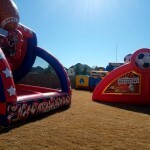 Jump City’s Football Challenge two lane Football Toss Inflatable Game! Players will be lining up to take their shot at the dual targets, which allow for plenty of action, fun and competitive spirit as players fire it in with mini footballs. This inflatable football game is designed on both sides to look awesome. A red, white, blue and yellow color scheme will match any party theme. 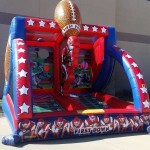 We can have this Sporting attraction at your home or event in our extensive delivery area including Plano, Lewisville, Dallas,and many other cities.